Why would a couple choose Cebu for their wedding? “Why not,” a Cebuana friend answered me incredulously. The look on her face was the perfect response for my asking such a ridiculous question. Silly me! Cebu will not be dubbed as the Queen of the South for no reason. Being a center of commerce and trade, Cebu is undoubtedly the world-beater of the Southern Philippines and is one of the country’s strongest economies. But this is not the only reason why people flock to Cebu. Business people, tourists and couples travel to take pleasure in the beautiful scenery Cebu offers. Most of them choose the Queen City for their special occasions, such as weddings, for it offers a diversity of beautiful, exotic, and romantic places. Cebu also boasts of abundant supplier resources to make event planning truly hassle-free. Moreover, Cebu doesn’t just offer what a couple need for their most special moment, instead, it offers the best. From wedding venues to wedding photographers, from wedding gown designers to wedding caterers – Cebu has proven to be a powerhouse. So the better question to ask is: Why NOT say “I do” in Cebu? There are a great number of places to visit and adventure-filled activities to do in Cebu. The island is famous for its white sand beaches, clear blue waters, and superb diving spots. You can just imagine yourself relaxing on the white sand under the sun, or enjoying and exploring the clean and cool waters with your loved one before and after your wedding day. If you and your partner are beach bums, you should not miss the best place – the beautiful beaches in Mactan for a truly romantic beach wedding. Why Not Celebrate Your Wedding in Cebu’s Luxurious Hotels? Cebu features various lavish hotels and resorts – from five-star to one-star. Some of these are listed under the Philippines’ finest and all of them accommodate individuals and couples and offer them utmost satisfaction and convenience at a very reasonable price. Why Not Wear a Bridal Dress From Cebu? Cebu is the home to the best Filipino fashion designers. Talent from the region just continues to overflow. Why Not Find the Best Florists in Cebu? Scented Petals Flowermix Shoppe is one of Cebu’s promising flower and event stylists. With office located in Cebu City, Scented Petals Flowermix Shoppe provides flowers and event styling for every couple for their most special day, their wedding day. They’ll provide you with the most beautiful set-up you’ll need for your wedding day. Why Not Loosen up While Preparing To Tie The Knot? Wedding preparations take time and effort. If you don’t want to hassle yourselves and look tired during your big day, why not just take the services Cebu wedding planers have to offer? Worry not because Cebu professional wedding planners like Belle Mariee can help make your dream wedding an easy reality. Everything you need for your wedding is well-provided for in Cebu and wedding shops, professionals and establishments there will give you nothing but the best services and products. The Queen of the South is truly a queen even in the wedding industry. 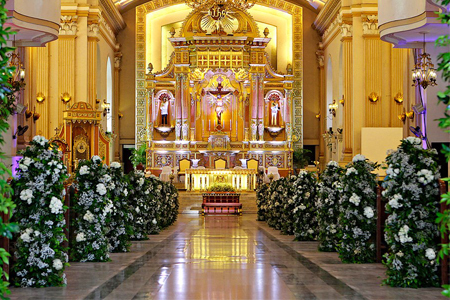 Indeed, the variety of beautiful wedding destinations and the accessibility of wedding suppliers and resources are the best reasons to say “I do” in Cebu.